One might imagine that Alex Kurtzman, a Hollywood writer often relied upon for studio mandated filmmaking, would have learned a thing or two from watching those he’s written for in the past. Be it J.J. Abrams, Marc Webb, or hell, even Michael Bay. Any one of these aforementioned directors might have shown glimpses of how to stylize, tap into emotion, or leave a unique impression on a certain popular property, but none of this seems to have left an impression on Kurtzman. One might imagine it would, but it seems that if you did you might have more of an imagination than Kurtzman period as his big blockbuster directorial debut is nothing short of a generic action adventure. To his credit, Kurtzman did write and direct the 2012 dramedy People Like Us which wasn’t terrible, but that you probably also don’t remember. Point being, while Universal is now attempting to get in on the cinematic world building game Marvel pioneered and Warner Bros. is following suit on they might have tried to do so by kicking off such an attempt with someone who displayed the opposite qualities of their endeavor meaning a leader rather than listener and obedient follower Kurtzman seems to be. While Kurtzman is at the helm of this mammoth monster movie the direction is not the weakest aspect of this drab blockbuster; that would be the screenplay. As one of six credited writers on the project, Kurtzman and Jenny Lumet (Rachel Getting Married) seemingly outlined the story before Universal brought in the likes of Jon Spaihts (Prometheus, Passengers) to juice up the script, but they weren’t done yet, no, as Dylan Kussman (an actor of bit parts in lots of big movies who seems to have made the right friends) along with Christopher McQuarrie (The Usual Suspect, Mission: Impossible – Rogue Nation) and David Koepp AKA the OG Alex Kurtzman were brought in to add to the screenplay and presumably help map out where exactly this “Dark Universe” might lead. Well, if The Mummy is in fact how Universal is going to kick-off this supposed series of films (it was originally intended to be 2014’s Dracula Untold, but we all see how that turned out) audiences would be led to believe this is going to be a tone-deaf and unoriginal endeavor leading me to believe there might not be much of an audience at all. Jenny (Annabelle Wallis) and Nick (Tom Cruise) prepare themselves for a crash landing. The Mummy begins by introducing us to a conspicuous Dr. Henry Jekyll (Russell Crowe) whose team has discovered catacombs under the streets of London containing that might hold an artifact that is key to piecing together a centuries old myth that Egypt wiped a princess from the history books. We are immediately taken back to this time via Jekyll’s exposition, which Crowe delivers as best he can, and meet Princess Ahmanet (Sofia Boutella) who is the first in line to replace her father until his new, young wife gives birth to a child-a boy-automatically usurping Ahmanet’s destiny. Determined to reclaim her rightful place and take back the throne Ahmanet makes a deal with the God of Death, Set, who promises her as much in exchange for a human form that he might inhabit. Setting up that Ahmanet is ruthless and willing to do whatever it takes to obtain power we watch as she kills her entire family and prepares a sacrifice, but is stopped just before she is able to do so. As punishment for her actions, Ahmanet is mummified and buried alive in a tomb a thousand miles away from Egypt in Mesopotamia which is present day Iraq. Present day Iraq brings us into the modern day where we are then introduced (yes, we’re still on introductions) to Nick Morton (Tom Cruise) and Chris Vail (Jake Johnson) who are soldiers who moonlight as black market dealers that search out and sometimes steal antiquities in hopes of turning a pretty penny. When they accidentally open Pandora’s Box and essentially set free Ahmanet they become privy to the fact there is more or less a continuum of these gods and monsters and that Princess Ahmanet is only one of many. Cruise’s Nick comes to this realization due to the fact he seemingly had a one night stand with archeologist (maybe? I’m not even sure what her actual title was) Jenny Halsey (Annabelle Wallis) and is now in love with her and she reluctantly with him, so naturally they must fight to keep one another alive. Why might this ancient mummy lady be after Nick you ask? Well, Nick was the one who set her free you see, and so now he is the chosen one. Nick is now the object of affection for which Ahmanet will sacrifice so that Set may have his earthly shell. Luckily, Jenny is employed by a certain aforementioned doctor who might be able to help Nick, but given what we know about Mr. Jekyll’s personality things are obviously going to get a little complicated. The chief issue with The Mummy though (besides the script), is the fact it doesn’t feel like a "mummy" movie. Rather, the tone is all over the place as Kurtzman seems to initially take on the idea of playing into our modern expectations of a Tom Cruise picture (action scene in the desert with big explosions) before rescinding that decision and going for a darker tone and matching aesthetic that is paired with some genuinely curious choices in reference to placement of humor. This lack of any through line of tone or even a sense of an idea as to what they actually wanted this to be is lost between the shifts of Cruise and Wallis running away from these zombified ghouls that Ahmanet creates once she is brought back and Cruise having a discussion with a presumed dead Jake Johnson in a woman’s bathroom in a bar in London. Don’t get me wrong, I’ve always appreciated Cruise’s comedic chops, and at least the bit in the bathroom is somewhat inspired if not slightly derivative, but it feels so out of place in whatever the rest of this movie is trying to be that it just doesn’t work. And the key word here is trying. While at one point it would seem Kurtzman was very much hoping to tell a contained story it is that studio mandated mentality he’s always adhered to that brings around the other point where they are doing endless world-building and no doubt setting things up for future installments that none of it comes together in a cohesive manner. Kurtzman is trying to find a balance between the two and that is fine, appreciated even, and while the movie as a whole fails to be satisfying on its own terms the factor that most represents a true attempt at balance is one of the few things that works for the better in this new take on an old tale. Ladies and gentlemen, I present to you Crowe’s turn as the well-intentioned Dr. Jekyll and the devious Mr. Hyde. In this role of Jekyll/Hyde Crowe is allowed to camp it up quite a bit which is fun to watch, but more than this the character itself serves as the medium between the world as we know it and this one on the brink of being consumed by these gods and monsters. As one might surmise, Crowe is only allowed a brief amount of time on screen by comparison which is a shame considering the time this thing dedicates to the unnecessary love story that is meant to serve as the crux that serves Cruise’s Nick when it comes deciding whether he himself is a hero or a villain. It also doesn't help that Wallis simply fits the bill of leading lady without actually providing any of the charisma typically required of such. Ahmanet (Sofia Boutella) is a mummy in The Mummy. In earnest, I wanted to like The Mummy and I think Kurtzman and his team wanted to make a fun, popcorn movie audiences could enjoy, but while the film has a few things going for it here and there it ultimately feels so unoriginal, uninventive, and uninspired it’s hard to muster any kind of reaction at all. Cruise, for all his effort and energy, is seemingly the last thing on this movies mind. Again, it’s easy to appreciate the film for not sticking Cruise with another “smartest/slickest person in the room” character a la Ethan Hunt, but more this gets back to the essence of what made Cruise a star in the first place: a rascal of sorts who bucks against the system in order to get the girl and learn a lesson of selflessness in the process. 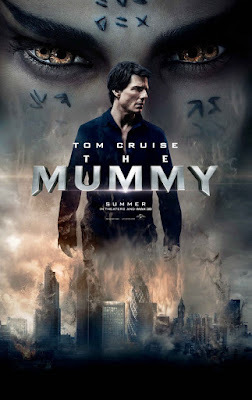 Though The Mummy doesn’t feel like a "mummy" movie nor does it necessarily feel like a Cruise movie it somehow still plays into Cruise’s best and most appealing qualities. With that said, this is called The Mummy and yet we hardly scratch the surface of what Boutella, a talented actress with a genuine presence as was glimpsed in Kingsman and Star Trek Beyond, might actually have done with such a role. Though we see the origins of Ahmanet as well as the power she wields in the present we are never delivered a fully, fleshed-out character (irony accepted) with sincere motivations or interesting complexities. This mummy is not a misunderstood monster or a tragic figure in any sense, but more she is a one-dimensional archetype who craves power and who will go to whatever lengths necessary to obtain it. Had the film figured out the heart of its movie was in fact its titular creation rather than trying to shoehorn in a movie star and make him the main character for the purpose of future installments and actually committed to the horror genre rather than that of romantic/thriller/comedy we might have been onto something a little more interesting if not more intriguing than the conveyor belt of a product we’ve now been saddled with. Everything down to Brian Tyler’s forgettable score give The Mummy this vibe that we've seen and heard it all before. The dialogue provides sad excuses for banter, the special effects look cheap when everything about Egyptian lore should at least look magnificent, and the plot is really obvious and rather dumb all of which could have been improved with more focus on the moment and less minds looking toward the future. But hey, that airplane sequence you’ve heard Cruise selling on his marketing tour is legitimately exhilarating, so that counts for something, right? Surely, but it’s not near enough to make The Mummy memorable.